The "City of a Hundred Spires" is the capital and largest city of the Czech Republic. Prague was established around 880 when Prince Borivoj built Prague Castle. The city is the chief cultural, commercial, industrial and educational hub of the Czech Republic, and served as the capital of Czechoslovakia from 1918 to 1993. Since the fall of Communism in 1989, Prague has become a major tourist attraction, revealing its beautiful sights to visitors from all over the world and regaining its spot among Europe's most important capitals. Unlike many central European cities, Prague escaped serious damage during World War II and therefore remained one of the most beautiful cities on the continent. The historic heart of the city is situated on the banks of the Vltava River, with several architectural treasures around the famous Staromestske Namesti (Old Town Square). Many bridges connect the two parts of the city, the most famous being the early-15th century Karluv Most (Charles Bridge) which was the only river crossing in the old center for roughly 400 years. The Vltava River at sunset. Move your mouse over the image for a close up of the buildings. Prague Castle. Move the mouse over the image for a different shot. Prague Castle with the Charles Bridge in the foreground. Vltava River from the Charles Bridge. Move your mouse over the image for a close up. The Charles Bridge at night. Move your cursor over the image for another view. The view in front of our hotel on Kremencova. Move the cursor over the image for a close up of Uflecku, the bar next door established in 1499. Typical building facade in Prague. Move your mouse over the image for a different shot. The facades of many buildings are works of art. Move your mouse over the image for a different shot. The Municipal House, an art nouveau building from the early 20th century housing a huge concert hall – the Smetana Hall – the venue for some of Prague’s most prestigious concerts, as well as a large art gallery. Old Town Square. Move your mouse over the image for a close up. Tyn Church in late afternoon. Move your mouse over the image for the same shot at sunset. The Clock Tower in Old Town Square. Move your mouse over the image for a shot of the astronomical clock on the lower part of the tower. The oldest part, the mechanical clock and astronomical dial, dates back to 1410. 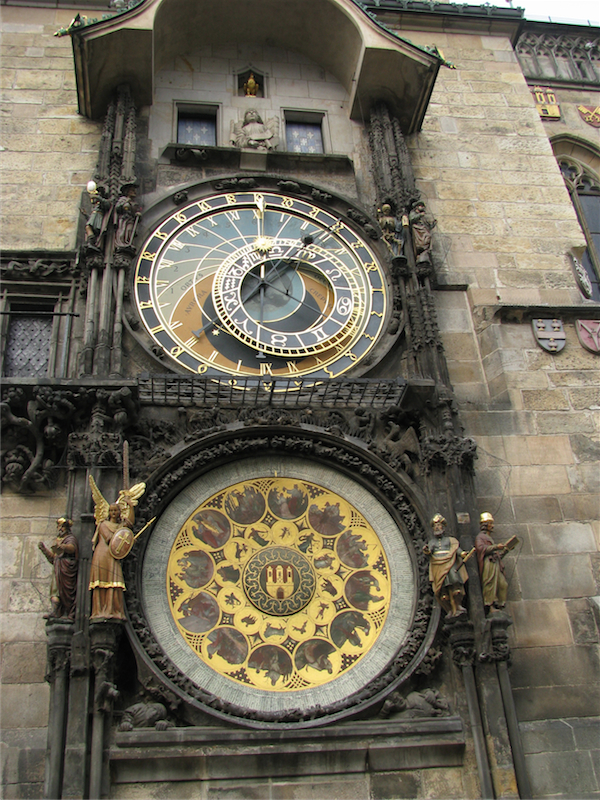 Later, around 1490, the calendar dial was added and clock facade decorated with gothic sculptures. In the 17th century moving statues were added, and figures of the Apostles were added after major repair in 1865-1866. It suffered heavy damage on May 7 and especially May 8, 1945, during the Prague Uprising, when Germans directed incendiary fire from several armored vehicles and an anti-aircraft gun to the south-west side of the Old Town Square in an effort to silence the provocative broadcasting initiated by the National Committee on May 5. The hall and nearby buildings burned along with the wooden sculptures on the Orloj and the calendar dial face made by Josef Mánes. The machinery was repaired, the wooden Apostles restored by Vojt?ch Sucharda, and the Orloj started working again in 1948. The mechanical clock and the astronomical dial. Just above the mechanical clock are the two windows where the figures of the apostles appear as the clock strikes the hour. A close up of the mechanical clock. Move your mouse over the image for a shot of the wooden apostle figures which appear every hour on the hour. When the clock strikes the hour a town crier appears, and plays his trumpet on all four sides of the tower. Move your mouse over the image for another shot. At the top of the clock tower. Move your mouse over the image for a better shot of the Tyn Church. Having beer in the Old Town Square. Move your mouse over the image for a shot of Evan and John. Beer at Uflecku, established in 1499. Move the mouse over the image for a different shot. No need to go outside for a smoke at Klub Architektu. Move your mouse over the image for a different shot. The Charles Bridge in the background. Move your mouse over the image for a better shot. Statue near the Charles Bridge. Move your mouse over the image for a close up. Two views of Prague and the Vltava River. Move your mouse over the image for the second shot. At Prague Castle. Move your mouse over the image for a different shot. St. Vitus Cathedral. Move your mouse over the image for a different shot. Inside St. Vitus Cathedral. Move your mouse over the image for a close up. Evan and Allan in front of the Palace at Prague Castle. Move your mouse over the image for a different shot. Looking back toward the Old Town Square from Prague Castle. The Tyn Church is visible just left of centre and the Clock Tower is to the right. Yet another gorgeous building in Prague. Move your mouse over the image for a close up of the statues. A sleek new tram. Like a lot of European cities, Prague has an efficient public transit system. An old tram whizzes past a McDonald's. The famous Dancing House or Ginger & Fred is the nickname given to the Nationale-Nederlanden building in downtown Prague. It was designed by Canadian-American architect Frank Gehry in co-operation with Croatian-Czech architect Vlado Milunic on a vacant riverfront plot (where the previous building had been destroyed during the Bombing of Prague in 1945). The building was designed in 1992 and completed in 1996.